Today we were comprehensively rained upon. Things started out in an unusual way, although with an excellent breakfast that included the promised pancakes and many other excellent things. 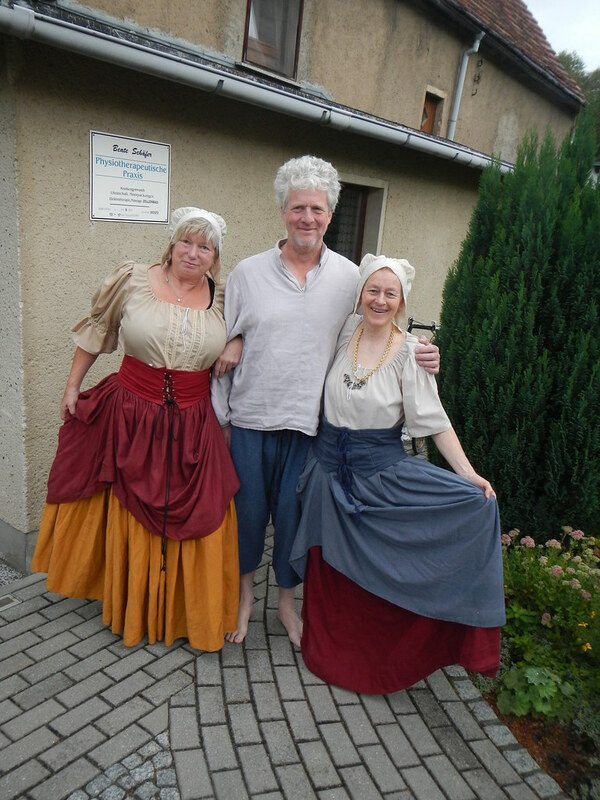 We were discussing the Altstadtfest with our hosts Manfred and Beate. She showed us a photo of them dressed in medieval costume for a recent birthday party and conceived the idea that we could dress up then and there and have our own photo! So we did and it was very funny. Manfred spoke to us about Gorlitz and its loss of population after reunification, its current status as a city of old people, and minor local border tensions with Poland. The Neisse radweg took us through forests, fields, small villages and sometimes along the actual river. Border posts placed along the river on the German and Polish sides make a visual declaration of territory. We often see solar and wind farms – Germany is investing heavily in renewable energy sources. Hunting towers built high off the ground are everywhere in country areas so beware if you are a rabbit or a deer. The German people love their summer gardens. Colourful flowers are a delight along the way and every available garden plot and plant container is full of geraniums, petunias, sunflowers and azaleas. Vegetable gardens are abundant in every back yard. Bad Muskau was our stopping place, a town right on the border. It has a fine schloss built by Count Pueckler and set in an enormous park. It has been renovated from a state of ruin over the past 20 years. The Polish side, Leknica, is a border town reminiscent of Hrensko, with cheap cigarettes and clothing for sale in roadside stalls immediately over the bridge. We had a delicious German dinner in the cosy Muskauer Hof, just down the road from our pension. This entry was posted on 31 August 2014 at 7:33 pm and is filed under Europe 2014. You can follow any responses to this entry through the RSS 2.0 feed. You can leave a response, or trackback from your own site. Where are the photos of you in medieval gear? Don’t worr about wet rides, Berlin is going to be full of sunshine next weekend!